Singing karaoke for the first time can be scary. You might not think a “How to” guide to singing karaoke is necessary, especially if you’re not much of a karaoke fan. But even those who don’t actively seek karaoke can often get roped into it! You’ll be better off making the experience as painless (read: embarrassing train wreck-free) as possible. 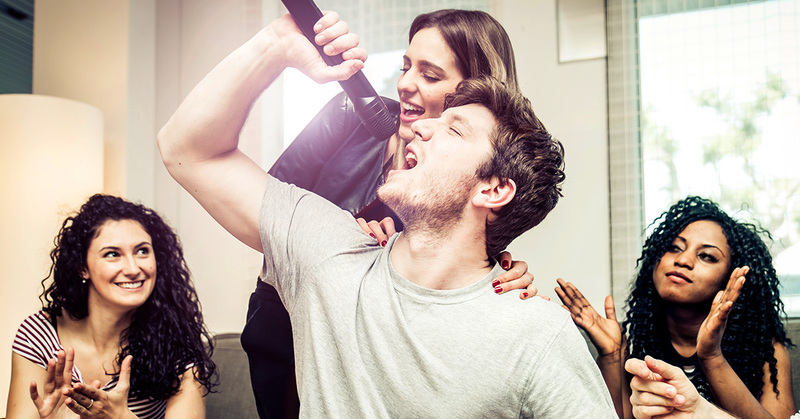 Here are some basic tips you might not have thought of to make your karaoke experience much more enjoyable for both you…and your audience. Choose a song that you know and that is easily in your voice range. Singing a song that you know really well will make it easier for you to give your best performance on stage. You can practice songs online at home or by singing along with the original recording. If you’re singing at a karaoke bar or party, singing an up-tempo song rather than a ballad will keep the crowd in a party mood (singing a ballad can clear a room.) “You Really Got Me” by The Kinks is a good song in a mid-range that almost everyone can sing easily. Choose a song that’s under 3 or 4 minutes – unless you’re a pro and really know the song well. Singing for more than 3 or 4 minutes on stage will seem like a really, really long time. Although it might seem like a good song choice, “Hey Jude” by the Beatles, is over 7 minutes long. It would be best to sing it online rather than on stage! No matter how well you move, entertaining the audience with your dance moves is part of the fun, particularly during musical breaks (if you’re not comfortable dancing by yourself on stage, you might want to make sure that the song you choose does not have long musical breaks). Barry Manilow’s “Copacabana (At The Copa)” is a great song choice, but be prepared to dance around the stage for almost 2 minutes in the middle of the song. Don’t be discouraged from singing songs with musical breaks, just be prepared to do something during them. Not only will you have more fun if you know the lyrics really well and don’t have to rely on the screen, the audience will enjoy your performance much more if you’re moving around the stage and at least sometimes looking out into the crowd and smiling. Any audience participation will increase the amount of applause you receive at the end of your performance. It’s a win-win situation, the audience will enjoy your song more and so will you! Singing karaoke is all about having fun. After you’ve sung your song and basked in the applause, hand the mic back to the KJ and let someone else have their moment on stage. While you’re not on stage, sit back and enjoy other karaoke performances and encourage others by listening to their performances and applauding. When it’s your turn you’ll get back what you give. However and wherever you sing karaoke, remember to have fun. You’re only as good (or bad) as your last performance and unless you’re recording songs and publishing them online, chances are that you’ll be the only one to remember your performance. Ready to throw a karaoke party or want to practice solo? The Stingray Karaoke mobile app has you covered! The full song catalog consists of more than 13,000* licensed karaoke songs in many genres, eras, and languages. Songs in the style of today’s artists like: Shawn Mendes, One Direction, Taylor Swift, Justin Bieber, Adele, and more. Songs in the style of yesterday’s legends: Elvis, The Beatles, Bon Jovi, Queen, ABBA and more. Genres include pop, rock, R&B/hip-hop, Disney, country, Latin, and more.